Here is TeamRock’s roundup of all the news snippets from around the world of rock and metal on July 17, 2016. Compiled by our news team at TeamRock HQ. For today’s regular, more in-depth news stories, click the ‘News’ tab in the menu above. 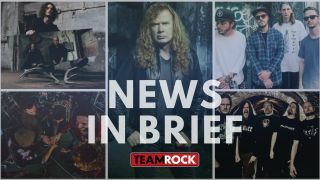 Megadeth have been forced to cancel the remainder of their European tour in light of bassist David Ellefson breaking his foot on Friday night. The injury resulted in the band calling off their show at Rockmaraton in Hungary. They also had to pull out of their planned Harley Days performance in Slovakia on Saturday night, and have confirmed they won’t appear at tonight’s (July 17) Masters Of Rock festival in the Czech Republic. Megadeth’s next scheduled performance is in Ecuador on July 30. Meshuggah have announced a North American tour. They’ll be supported by High On Fire, with the new dates taking place in October and November, and come ahead of their previously announced European run of shows. The follow-up to their seventh album Koloss is expected in the autumn. Crown The Empire have released a video for their track Hologram. The song features on the US outfit’s third album Retrograde, which is set to launch on July 22 via Rise Records. Crown The Empire are currently out on the road as part of the Vans Warped Tour, which runs through August 13. Raveneye have confirmed that their debut album Nova will be released on September 23 via Frontiers Music Srl. Nova is available for pre-order, while the tracklist and cover art can be seen below. Moose Blood have announced a list of intimate shows across the UK. They’ve lined up the performances in support of second album Blush, which will be released on August 5 via Hopeless Records. They’ve released Honey and Knuckles from the follow-up to 2014’s I’ll Keep You In Mind, From Time To Time.